Andreas and Gabriella Sitnikow founded AG Bakehouse in 1990. Its success and growth from a single baker to employing ten others is attributed to each of their particular skills. Master Baker Andreas brought extensive European experience as well as acknowledgement of his talent and dedication, while Gabriella has mastered the business side of AG Bakehouse. Passion for his creations is well balanced by a philosophy followed by Andreas - ‘a first class product always finds a market’. 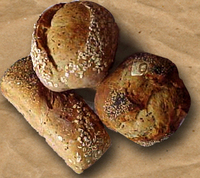 The range of their breads is not vast as quality is of the utmost importance. A sour dough culture developed by Andreas in 1992 forms the basis of most of the products, and a distinctive addition of grains, seeds and other natural ingredients produces beautiful loaves. High nutritional values have been scientifically tested and, more significantly, NO additives, preservatives, flavours, colours, dairy products, oils or fats are used. AG Bakehouse breads are becoming widely sought by those with allergies or intolerances while the rye loaves are ideal for those with yeast intolerance. While AG Bakehouse breads are readily enjoyed in Australia, Schwarzbrot (‘black bread’) has taken a little longer to be accepted. Andreas brought his love of this northern European style of bread with him and was surprised that it seemed a little strange in his adopted county. As the only baker making this style within Australia, acceptance has been gradual but very positive as its richness of flavour and texture can be successfully matched with cheese, meats, fish and even fruits. The growing network of delicatessens and other retail outlets selling AG Bakehouse breads is a genuine indication of the demand for these delicious breads from AG Bakehouse.